HOW TO JOIN THUNDER’S FANCAFE | OH THUNDER! Daum Cafe is a Korean fan community site where fans can get official updates from their artist management, interact with their favorite artist in an exclusive setting, and also participate in fanclub activities and get fanclub benefits. First, you need to have an account registered into the Daum website. All you need is an e-mail address and create your Daum ID and password. 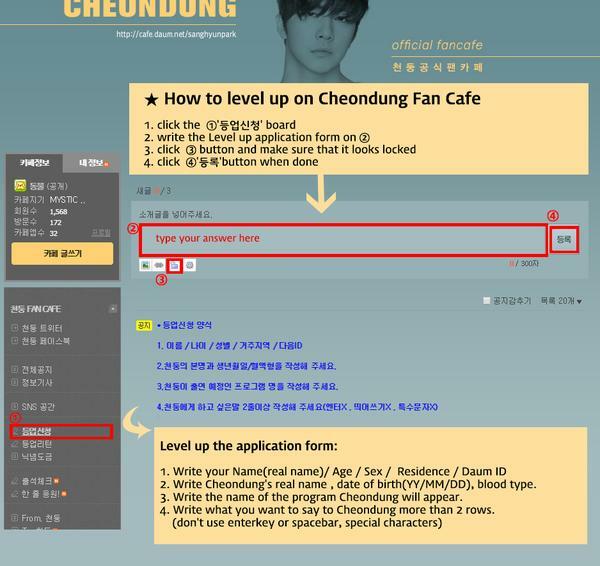 Then you can register into Cheondung’s official fancafe. Um what do you mean by name of the program cheondung will appear? His drama ‘Make a woman cry’ or some other current program? And are we supposed to type everything without using spaces? How will they understand then? Captcha code: I write it right but it still said I wrote wrong. What should I do? i cant write in korean! !